Without a proper marketing strategy, marketing efforts are bound to be unsuccessful, frustrating experiences. This especially true for online marketing and social media, and even more so for small business with limited budget and resources. While online services in themselves are easy to use, the challenge is to come up with a comprehensive and organized way of putting them to use. Losing oversight happens all too quickly. Before you embark on a journey you create a plan. You may even formalize it and create lists of things to take with you and things to do before you go. 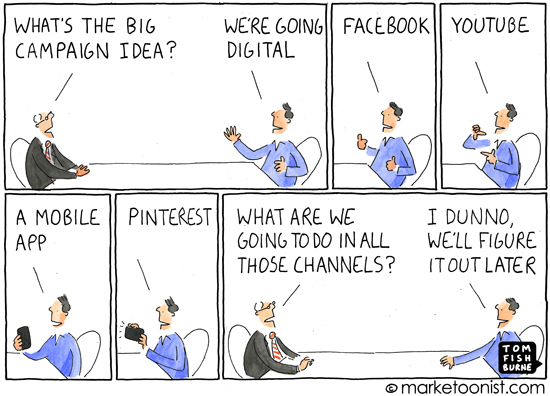 Marketing is, of course, no different. It requires a plan. Anyone who has ever done serious marketing will likely have created a marketing plan of some sort detailing the product, prospective buyers, budget, strategy, and so on. If you haven’t, you’re not doing it right! Have you thought about Social Media? Really thought? Let’s assume for a moment you have a plan. 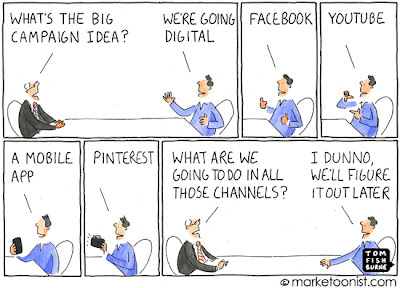 Does your plan incorporate online marketing efforts? And if so, to what extent? Most small businesses that we at Content Marketing Wizard encounter factor in ‘online’ almost as an afterthought. Even though they are usually well aware of the importance of online marketing nowadays. For most of these businesses, it is simply too big a subject, too big a burden on their (time) budget. Even more so than with traditional marketing techniques, online marketing requires planning. This is because the number of online channels and platforms is enormous. Blogs, social media, newsletters, whitepapers, audio, video and many more make up a huge intertwined web, no pun intended. The challenge you stand for is determining which ones will work for you. Another challenge is making sure you publish content on a regular basis so that someone, somewhere picks up your story. For small businesses, probably the biggest challenge of all is keeping track of what you already did, will do in the future, and where to do it. Trust us, you get lost very, very quickly. Organizing all this is not an easy task. With this in mind, Content Marketing Wizard created the Audience Creator. It is a step-by-step method that not only assists you in devising a marketing strategy and plan from scratch, it also offers provides a framework and tools to carry out your plan. By having a structured method, at least you don’t have to worry about the organizing part. It is really a great and helpful piece of info. I’m happy that you simply shared this useful info with us. Please keep us up to date like this. Thanks for sharing.